The 16" water tight Learn to Swim mirror is a great teaching aid for swim instructors and can help young children of all ages learn to swim and gain confidence in the water. 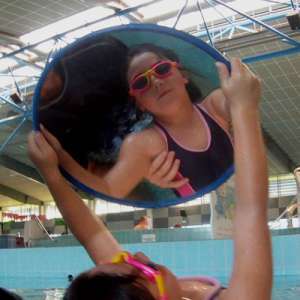 For many young children, learning to float on their back and put their head under water can be scary but with the Learn To Swim Mirror, lessons are fun and less frightening when they can see their own reflection. The aluminum composite back (ACM) and vinyl surround means the mirror is light and easy to handle in the water. Carton Dimensions 16" x 2" x 17"
ConvexMirrorShop.com is an approved DuraVision distributor. We secure your personal information with GeoTrust SSL encryption. For your peace of mind we offer secure payment facilities via Authorized.Net. We are a verified Authorized.Net merchant. For more details, please visit our privacy and security pages.